My wife has been cooking kinamatisang isda for many of our meals recently, and I can't get enough of it. 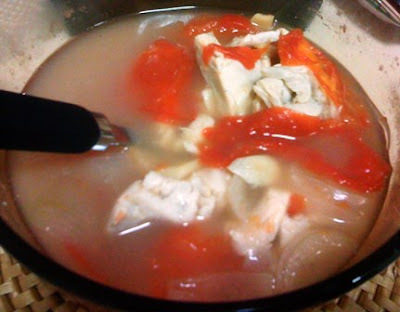 The soup base is yummy and has just the right taste of tomato in it for a bit or sour flavor, coupled with the mild "bite" the ginger and pepper lends to the dish. The tomato flesh becomes soft in the process; I just like including it with the fish. Tina is happy to share this recipe with you. Pour the water into a pot. 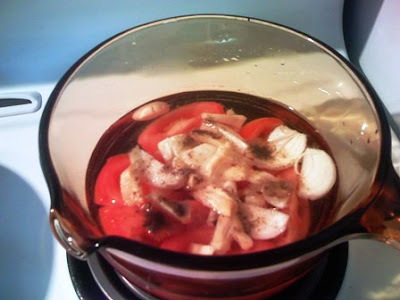 Add the garlic, onion, tomato, garlic and fish. Season with salt and black pepper. Bring to a boil. Add vinegar to taste (the quantity depends on your preference; around 2 tablespoonfuls will do). Be careful about stirring, as the cooked fish can break up easily. Add in your veggies (if there are any) and siling pangsigang. Simmer for a couple more minutes just to quickly cook the veggies.